The Macworld Lab handles a lot of hardware. Eventually, something breaks and you hope that it’s something inconsequential or easy to replace. But, every once in a long while, something happens to a major piece of hardware, something that makes your heart stop for a second. Like the time when we cracked the display glass on an iMac. 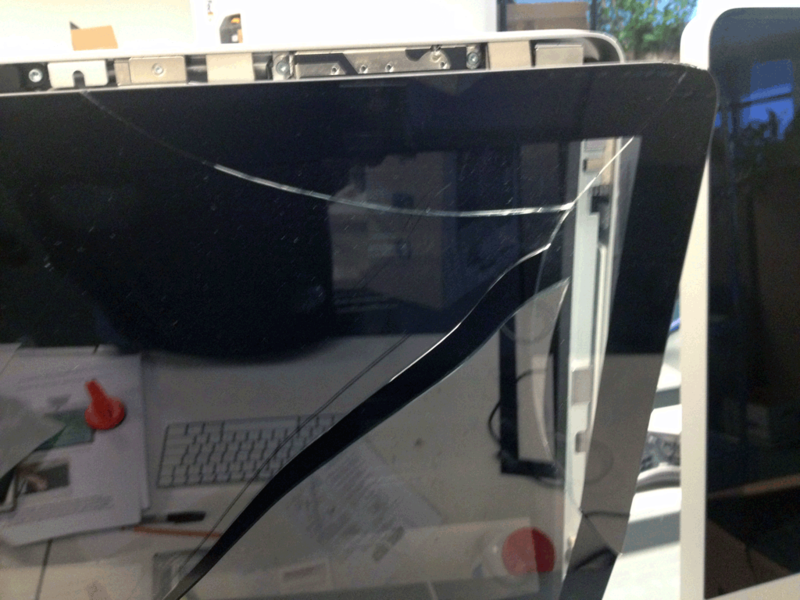 Broken: The glass on the front of our 21.5-inch Mac needed to be replaced. Fortunately, the damage was only to the glass. The iMac itself was in perfect running condition. It’s actually very easy to remove the glass. Magnets hold the glass in place, and all you need are a pair of suction cups to attach to the glass so you can pull the glass away from the machine. Coincidentally, around the same time as our mishap, MaxM Digital released its new Macframe, a metal, glass-less frame that fits in the same space as the iMac’s glass front. 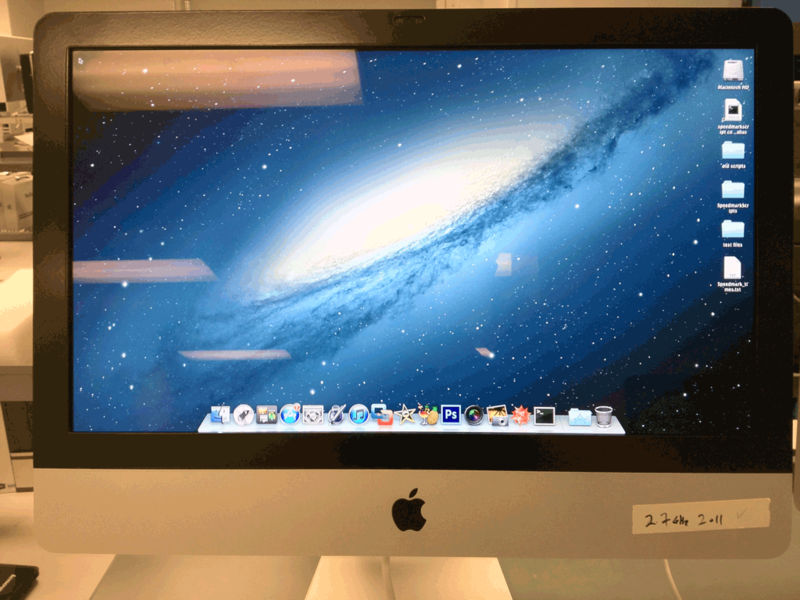 If you remove the iMac’s glass, the Macframe covers the area around the iMac’s display. 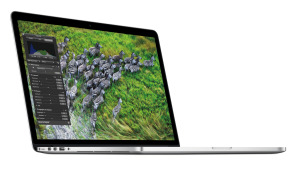 MaxM Digital offers a 21.5-inch Macframe for $49, and a 27-inch Macframe for $59. MaxM Digital says on its website that by removing the iMac front glass, “reflections and glare are significantly reduced.” The concept is similar to the what Apple did with the Retina MacBook Pro, where Apple removed the front glass of that laptop’s display to reduce glare by as much as 75 percent (according to Apple). By removing the front glass, you can cut down the amount of glare and reflection on the iMac, though MaxM Digital doesn’t make a quantifiable claim like Apple. So our purpose of using a Macframe became twofold: to replace broken glass, and to see how much glare and reflections are reduced by removing the glass. 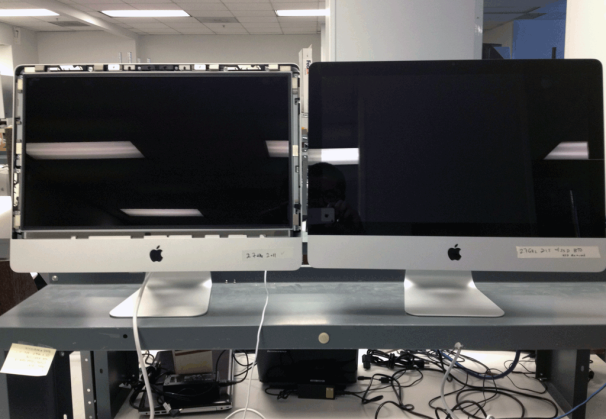 Glass-less iMac: What an iMac looks like (left) when you remove the front glass. MaxM Digital includes one large suction cup and one small suction cup with its Macframe, which work fine with unbroken glass. According to the Macframe installation guide, you attach the large suction cup to the upper right corner of the iMac glass, and then pull the glass away. Magnets: The Macframe is held in place by the iMac's magnets. In our situation, the iMac glass was broken in the area designated in the Macframe instructions. To remove the broken glass, we attached a pair of suction cups to the glass and pulled it off the iMac carefully. We used a different pair of suction cups in order to get the leverage we needed to remove the broken glass. Once the glass is off, you can see some of the inner working of the iMac. The sliver “tabs” around the display are the magnets. You’ll find magents along the sides and the top of the display. There are no magnets at the bottom of the display. Around the edge of the display is a foam strip that acts as a bumper between the display and the glass—the strip serves the same function with the Macframe. When you put the Macframe in place, it looks like there is a gap between the Macframe and the display, but this foam seals that gap, so you don’t have to worry about dust getting inside the machine. To install the Macframe, you attach the small suction cup to the top of the Macframe, and then insert the Macframe at an angle into the slot at the bottom of the diplay. Center the Macframe by making sure the edges of the Macframe are flush with the iMac. Then you move the Macframe towards the iMac until it snaps into place. That’s it. 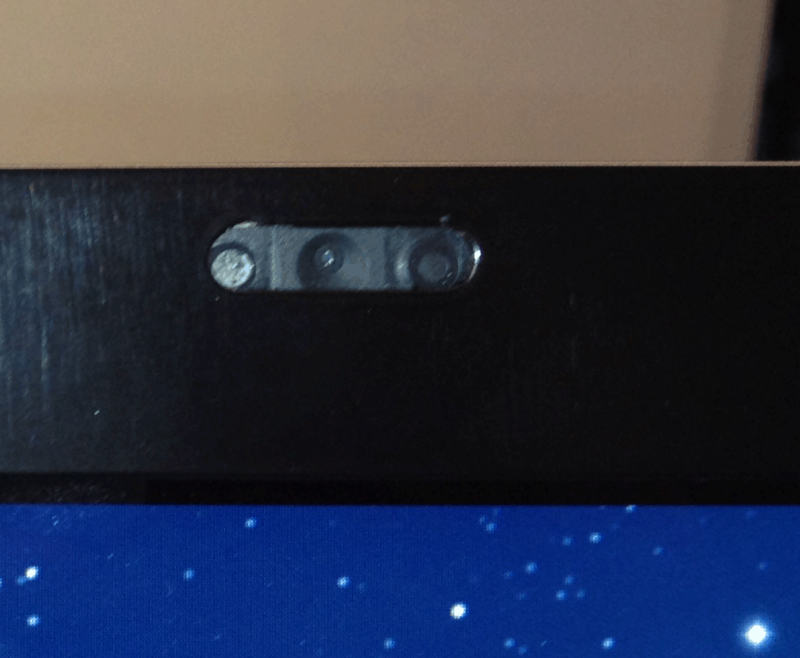 No-So-Hidden Camera: The Macframe doesn't disguise the iMac's webcam as well as the glass front. 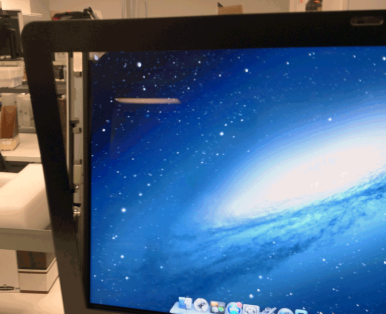 The Macframe itself doesn’t exactly match the black display outline of the iMac’s glass. If you look at the Macframe up close, it definitely has a painted look and feel to it. The one obvious cosmetic drawback is that the Macframe doesn’t hide the iMac’s built-in webcam as well as the iMac’s glass. The Macframe has a slot for the webcam, which makes the device much more apparent, compared to the small hole in the iMac glass. The iMac already has a glossy screen, and Apple puts glass in front of it. An iMac without its front glass doesn’t produce as much glare, but it’s not as if you’ve magically found an matte iMac screen. In our observations, the glare and reflections aren’t as severe, but at some angles, it's difficult to tell if there's an improvement. The ceiling in Macworld Lab has several fluorescent lights, and it can be challenging to find an angle without reflections or glare. During the unveiling of the Retina MacBook Pro, Apple representatives said that removing the front glass on the laptop reduced glare by 75 percent. You won’t see that much of a dramatic change if you remove the front glass on an iMac. Framed: Our 21.5-inch iMac with a Macframe. If you decide to keep the front glass off your iMac, keep it in a safe place. You’ll need to put it back on if you want to resell your iMac, or if you want to bring your Mac in to an Apple Store for service under warranty (to avoid the possibility that a glass-less iMac voids your warranty).